Brother, sister...can you spare a meal? If you're rearing a bed bug colony, they need blood. Yours, if you don't mind. Someone else's, if there's no one else around. A big draw at the Bohart Museum of Entomology's recent open house, "Parasite Palooza," was a bed-bug feeding demonstration, featuring bed bugs from a UC Davis-reared colony. When it was feeding time for the parasitic insects, Cimex lectularius, two scientists stepped forth and offered their arms in the name of science. Charlotte Herbert, who is studying for her doctorate in entomology, volunteered to be the first "blood donor." 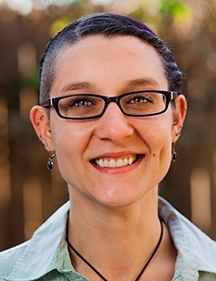 Next to step up was nematologist/parasitologist Lauren Camp, who received her doctorate last December at UC Davis. The particulars: Tabatha Yang, education and outreach coordinator for the Bohart, handed each scientist a bed bug enclosed in fine netting. 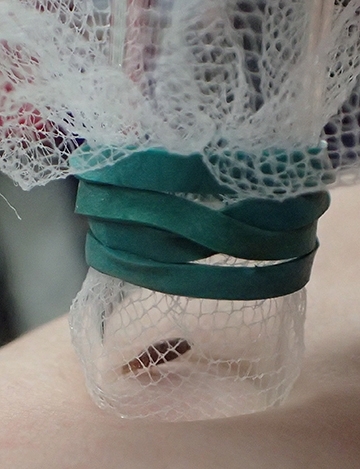 The netting proved fine enough to prevent escape, but large enough to allow feeding. "We don't want any escapees," Yang said. 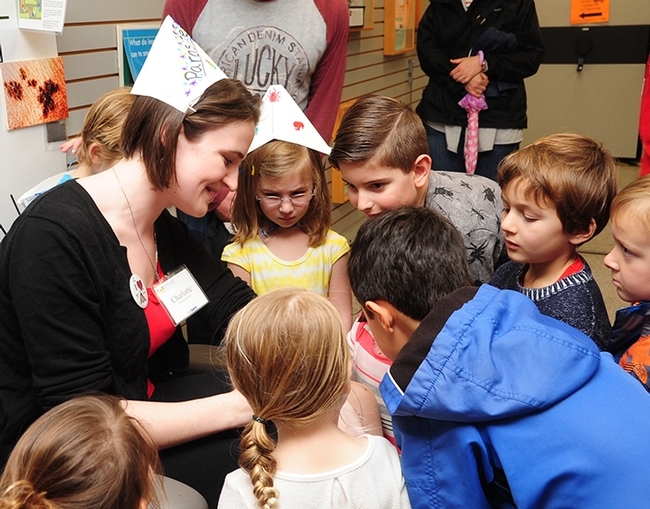 The Bohart Museum visitors, ranging from pre-schoolers to senior citizens, crowded around, asking questions and taking photos. The reddish-brown bed bugs went from flat to fat within minutes. 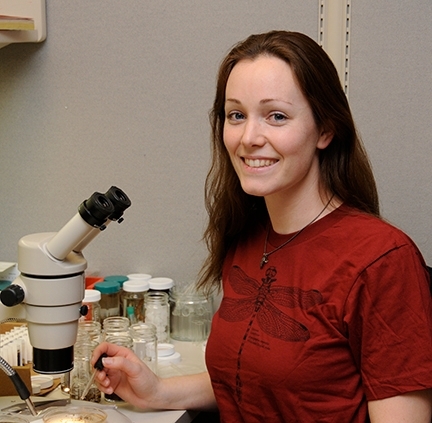 The insects originated from the parent colony of UC Davis entomology graduate Danielle Wishon, now a forensic investigator for the Sacramento Police Department. She began rearing them several years ago, intending to do research. 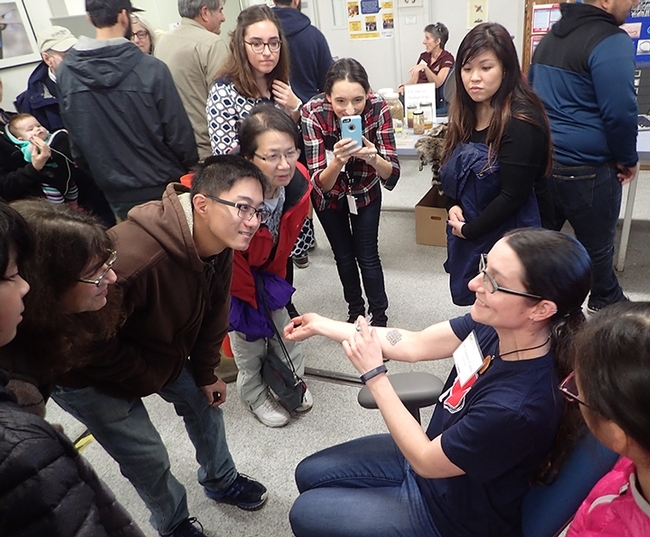 Later she gave some of her bed bugs to UC Davis researcher Jenella Loye of the UC Davis Department of Entomology and Nematology, who in turn loaned some to the Bohart Museum for its "Parasitic Palooza: Botflies, Fleas and Mites, Oh, My." Wishon says it's fairly easy to rear bed bugs. "If you want a fast growing colony, you can feed them once a week. When I was very actively feeding them, I chose to feed them once or twice a month so the colony didn't get too big too fast. I've gone as much as six months without feeding them, and they repopulated just fine. I started this colony several years back, but I would occasionally add individuals I find on mattresses discarded by UC Davis students during the great fall quarter move." 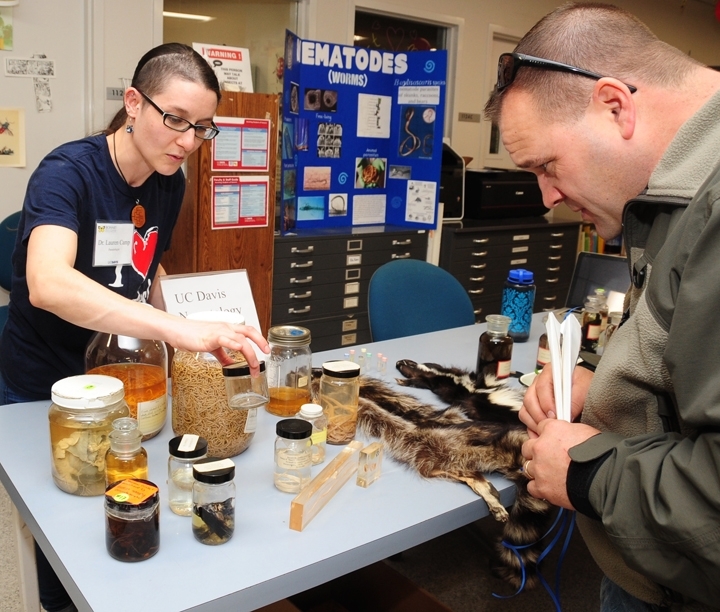 Wishon acknowledged that in the past, she 'sub-let' feeding responsibilities to forensic entomologist Bob Kimsey of the UC Davis Department of Entomology and Nematology faculty and to entomology student/Bohart associate Wade Spencer. "Hey, they offered!" she said. Has Wishon ever encountered bed bugs in a hotel room? "No, but I always look for their 'salt and pepper'--eggs and feces--first thing," Wishon said. "I had a friend come up and ask about bites after she stayed at a motel in California -- they were definitely bed bug bites. She's taken enough entomology to get a kick out of it so she wasn't upset." According to the Center for Disease Control and Prevention (CDC): "Everyone is at risk for getting bed bugs when visiting an infected area. However, anyone who travels frequently and shares living and sleeping quarters where other people have previously slept has a higher risk of being bitten and or spreading a bed bug infestation." "Bed bug infestations usually occur around or near the areas where people sleep," the CDC points out on its website. "These areas include apartments, shelters, rooming houses, hotels, cruise ships, buses, trains, and dorm rooms. They hide during the day in places such as seams of mattresses, box springs, bed frames, headboards, dresser tables, inside cracks or crevices, behind wallpaper, or any other clutter or objects around a bed. Bed bugs have been shown to be able to travel over 100 feet in a night but tend to live within 8 feet of where people sleep." 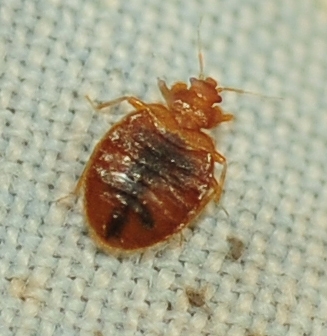 Bed bugs are not known to spread disease, according to the CDC. However, excessive scratching can "sometimes increase the chance of a secondary skin infection." Wishon noted that some people experience a "pretty negative reaction to the saliva--flu-like symptoms if I remember correctly. That's really the reason I want to keep feeding a colony even though I am not going to be doing research on them anytime soon--most of the older researchers I know who once fed a colony but stopped, or who traveled to countries where they were common and were exposed regularly but then moved back, and were exposed to them many years later, seem to develop hyper sensitivity to bed bug saliva. This could be completely anecdotal and coincidental, but I've heard this familiar story enough times to want to error on the side of caution and continue feeding without years of breaking. I don't want to develop a negative reaction to exposure." Both Camp and Herbert said they basically didn't feel much of anything when the bed bugs began feeding. Here's why: "When bed bugs bite, they inject an anesthetic and an anticoagulant that prevents a person from realizing they are being bitten," according to the CDC. "Most people do not realize they have been bitten until bite marks appear anywhere from one to several days after the initial bite. The bite marks are similar to that of a mosquito or a flea -- a slightly swollen and red area that may itch and be irritating. The bite marks may be random or appear in a straight line. Other symptoms of bed bug bites include insomnia, anxiety, and skin problems that arise from profuse scratching of the bites." Any reactions? 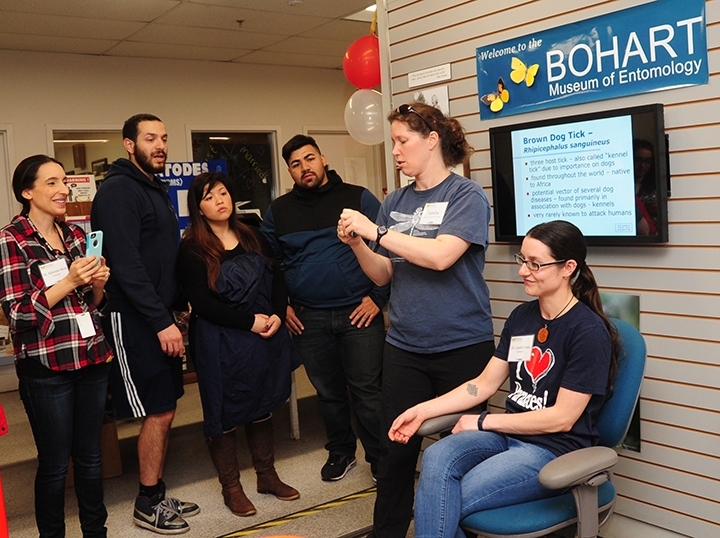 "It took a while, but I did react to the bed bug bites," Camp said. "On the third day (Jan. 25), I saw raised red marks on my right arm, that were a bit itchy. Guess it took me three days to react." Said Herbert: "I had a very small red mark where it bit, but no lasting marks or feelings. I felt it bite, but just barely. However, I have had bed bugs before while visiting my grandparents in the U.S. Virgin Islands and the bites were pretty terrible! I was itchy and thrashed all night, I didn't realize what was happening until the morning when I was covered in little bite marks and we found the bed bugs on the edges of the mattress. They looked very well fed! No wonder folks say: "Good night! Sleep tight! And don't let the bed bugs bite." 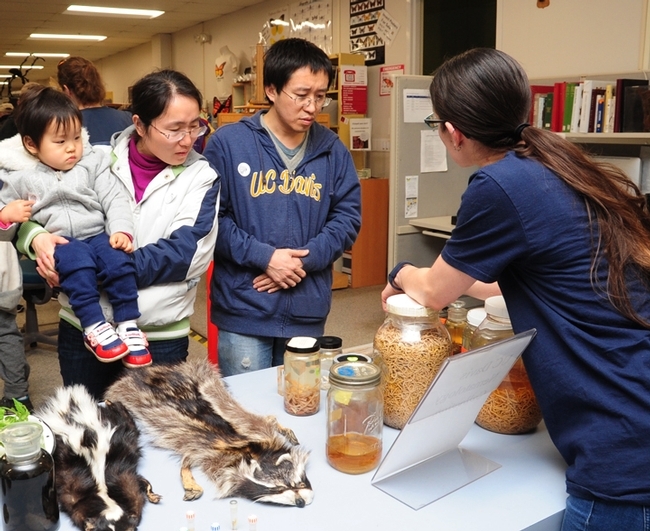 UC Davis nematologist/parasitologist Lauren Camp gets asked that a lot. 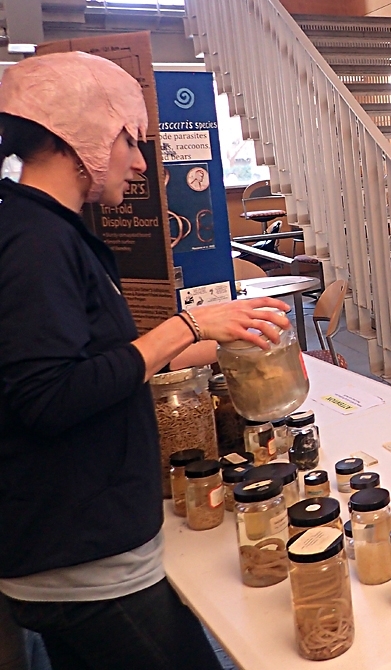 Her display table last Sunday, Jan. 22 at the Bohart Museum of Entomology's "Parasite Palooza" open house drew dozens of fascinated visitors of all ages. “Nematodes are an amazing phylum of organisms--they exist in almost every known environment on the planet, and different species eat everything from bacteria and fungi to plant and animal tissue," said Camp, who received her doctorate from UC Davis last December, studying with nematologist Steve Nadler, professor and chair of the UC Davis Department of Entomology and Nematology. "I find parasites particularly fascinating, because they are dependent on another organism (or organisms) for part or all of their life cycle." Camp staffed the table from 1 to 4 p.m., enthusiastically answering all kinds of questions and talking about her displays, which included nematodes from the stomach of a Minke whale (specimen from the California Academy of Sciences), the heart of a dog (pointer) infected with heartworm, and a tomato plant with nematode-damaged roots. "I got a lot of That's gross! and That's cool!" Camp recalled. "People were amazed by the whale stomach worms. Many were saddened by the dog heart infected with heartworm, but understood the importance of giving their dogs medication for heartworm." 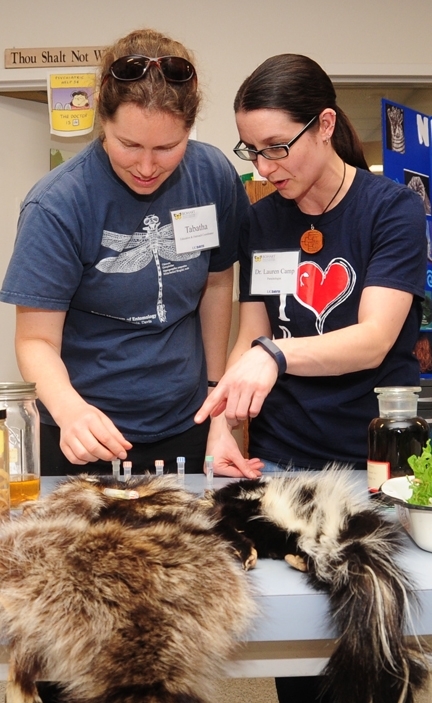 "One man knew about the raccoon parasite I studied--raccoon roundworm, Baylisascaris procyonis--and wanted to know more about its distribution in California," said Camp, who focused her graduate studies on the evolutionary relationships and genetic diversity of Baylisascaris procyonis. 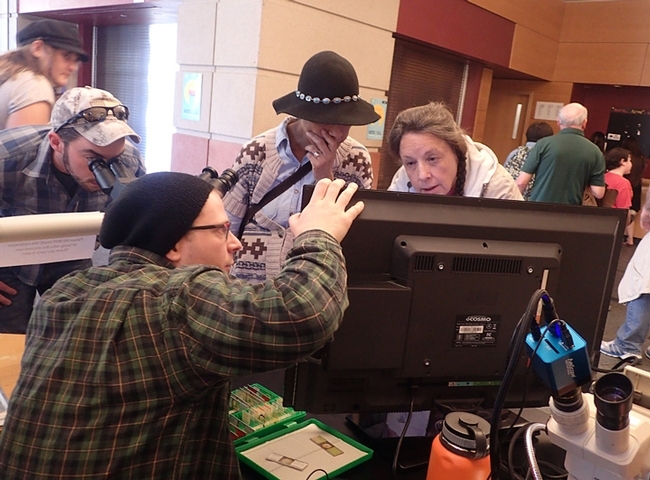 "He said he has a friend who thinks raccoons are cute and harmless, but I talked with him about how raccoon roundworm can be transmitted to humans. Though human infections with raccoon roundworm are rare (25 documented cases in humans since 1973), they can have serious health consequences. Some other people shared stories of pets--dogs, cats, and horses--infected with nematode parasites." 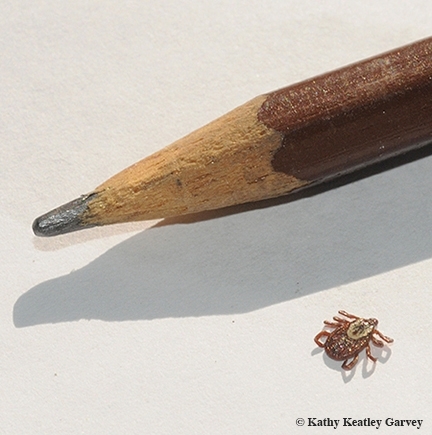 Regarding heartworm (Dirofilaria immitis) in dogs, Camp pointed out that the parasite is transmitted to dogs through mosquito bites, and more than 70 mosquito species can transmit it. Dirofilaria immitis is distributed across the United States, although its prevalence is higher in some U.S. regions, she said. A good resource? Check out https://www.capcvet.org/capc-recommendations/canine-heartworm/, a website that also includes maps of prevalence in the U.S. from 2011 and 2012. The tomato plant, infected with Meloidogyne incognita, came from postdoctoral fellow Rasa Cepulyte-Rakauskiene of the Valerie Williamson lab, UC Davis Department of Plant Pathology. "Meloidogyne species are also called root-knot nematodes--because they attack plant roots," Camp said, describing them as major pests of crop and garden plants around the world, including in California. Of California's top ten agricultural commodities in 2015 (https://www.cdfa.ca.gov/statistics/), root-knot nematodes infect all of the crops on the list: almonds, grapes, lettuce, strawberries, tomatoes, and walnuts. 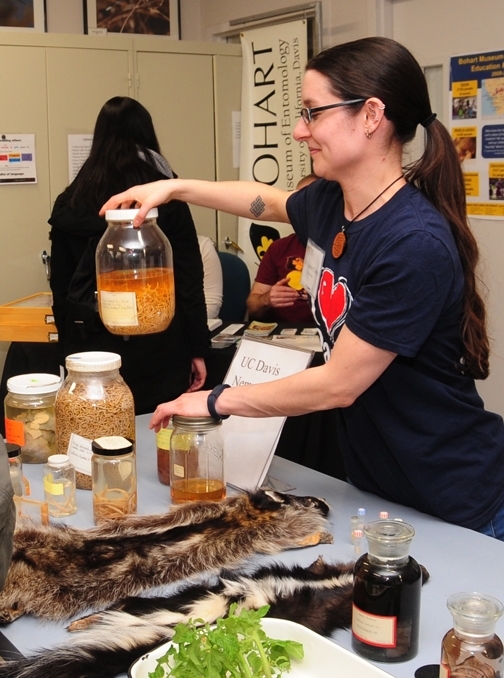 Camp, who hails from rural northern Indiana, first became interested in parasites as an undergraduate student at the University of Chicago, where she received her bachelor's degree in biology in 2005. She went on to earn her master's degree in biology from Wake Forest University in 2007. 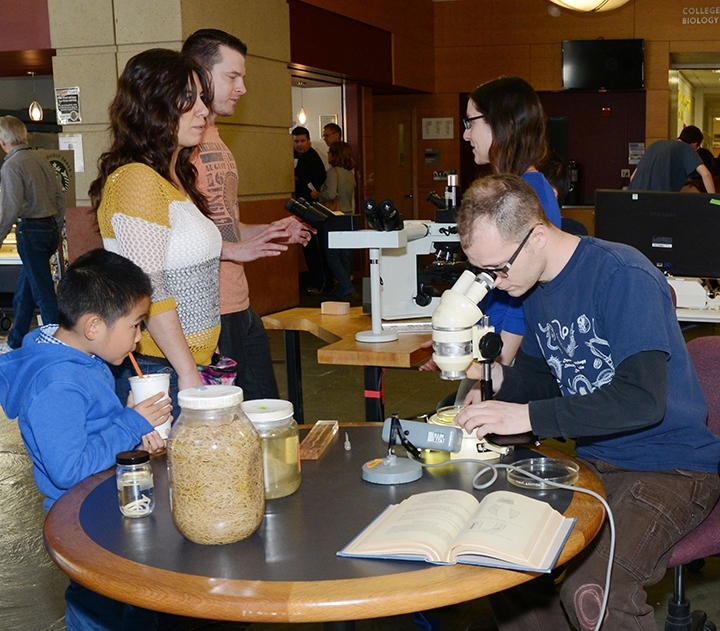 "My specific interest in nematode parasites developed when I read some of Dr. Nadler's work on the evolutionary relationships of nematodes for an invertebrate biology class. Her career plans: a researcher in infectious diseases or genetics/genomics or as a science communicator. Meanwhile, if you missed Camp's presentation at the Bohart Museum open house, not to worry. 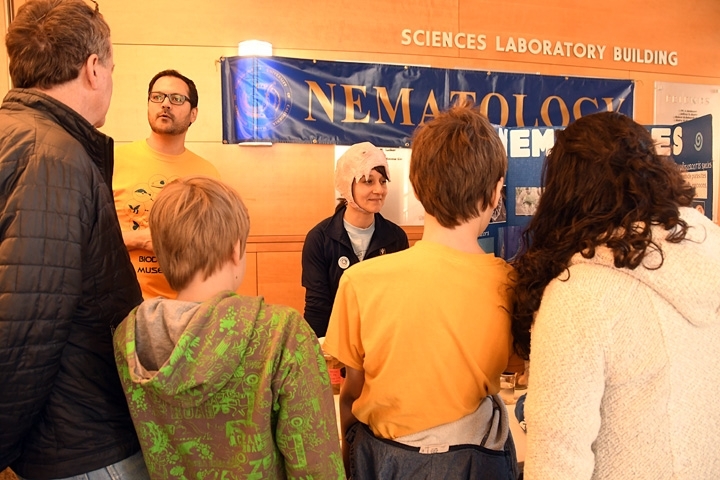 She's booked one more presentation this month and nematologists will table an event at the UC Davis Biodiversity Museum Day. Science Night Live Program: Camp will speak on "Nematode Need-to-Know: Roundworms Are All Around You” at the Science Night Live Program at 6 p.m., Wednesday, Feb. 1 at the World of Wonders (WOW) Science Museum, 2 North Sacramento St., Lodi. 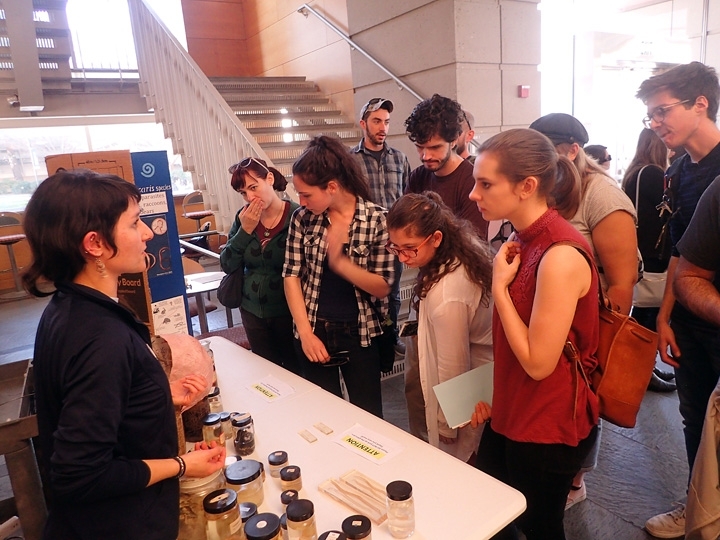 The two-hour event is billed as a “conversation with the parasitologist.” She will display nematodes ranging in size from less than one millimeter to eight meters long, or 30 feet. 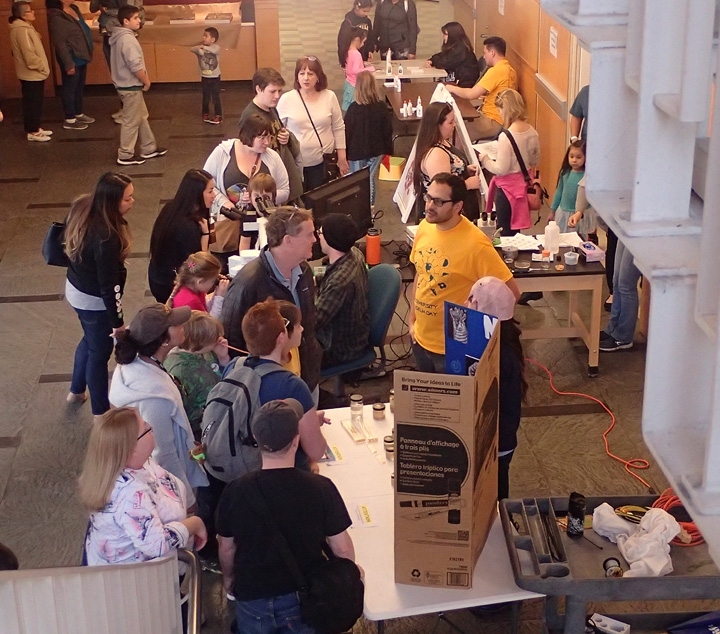 Camp also appeared Sunday, Jan. 22 on Good Day Sacramento's "Parasite Palooza" show with entomologist Jeff Smith, curator of the moth and butterfly specimens at the Bohart Museum of Entomology. 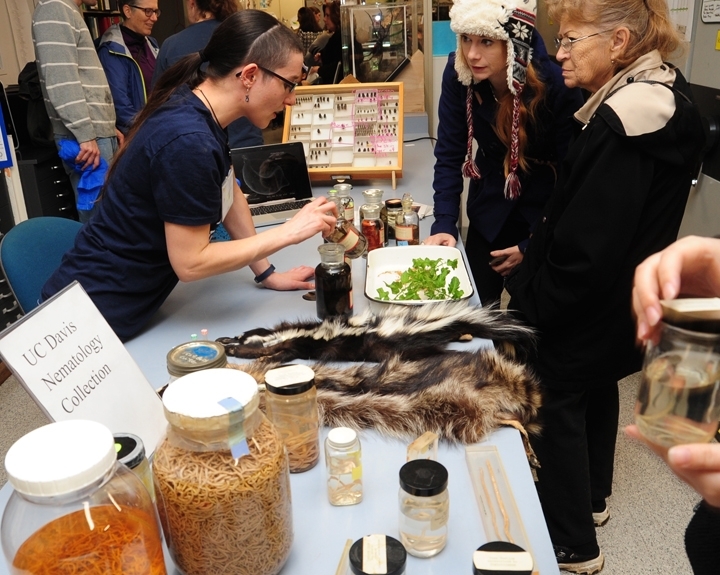 They shared and showed specimens and live insects. Camp mentioned a 30-foot-long whale nematode. (See http://gooddaysacramento.cbslocal.com/video/category/spoken-word-good-day/3610653-parasite-palooza/) She also spoke Feb. 1 to Capital Public Radio. See http://www.capradio.org/88726. "It's fun to talk about nematodes with the public," she said.